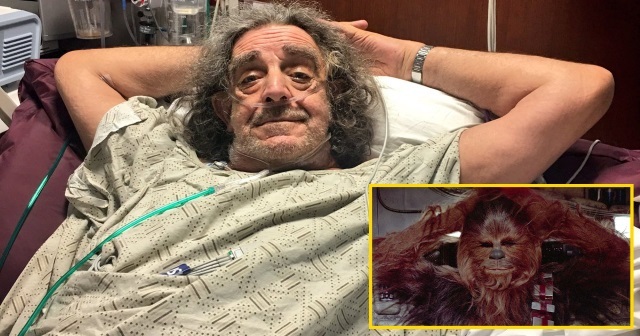 Peter Mayhew is on the mend after undergoing spinal surgery. Mayhew, who is originally from England but now lives in north Texas, has had health issues related to his height over the years. In a tweet posted today, he apologized to fans for being out of touch recently, and explained why with a picture from his hospital room. "Sorry, I’ve been quiet as of late," he said in the tweet. "I’ve been planning & going through some spinal surgery to improve my mobility. It’s been a success & I’ll be spending the upcoming weeks recovering. A big thank you to the doctors, staff, my family & friends that have helped me through this." The 74-year-old actor last played Chewbacca in 2015's Star Wars Episode VII: The Force Awakens. He also tweeted this, which shows he still has his sense of humor. In lieu of flowers and gifts sent to his hospital, Mayhew asked for people to donate to his foundation, which does a lot of charitable work across the country. He tweeted a link to donate. Post your thoughts in the comments section below on Peter Mayhew. In addition, share this on social media.